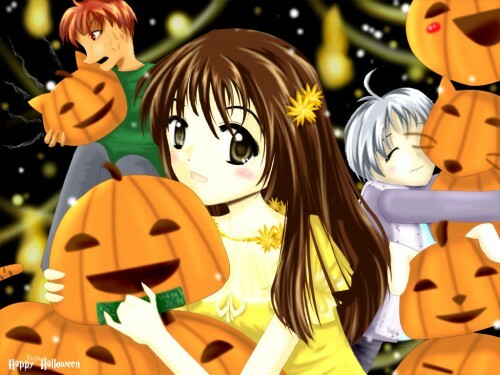 Fruits Basket Wallpaper: .Happy Halloween. Minitokyo »	Fruits Basket Wallpapers » Fruits Basket Wallpaper: .Happy Halloween. Very beautiful drawing and colors. oh fantasia, you impress me every time i see your work. when i saw it on mt start page i thought this is a wallpaper with a great scan but this is painted by you, so it really needs to be reviewed more often ^^ i'm not a fan of halloween but also here many ppl are having a halloween party. anyway i like the girl in the front best. she's so pretty and if i were a boy, i would fall in love with her heheh but i'm not and so it's "just" a fav. but i really like this doujin and the colors are just too great. Another excellent work! +Fav another piece of your great talent. :) My Fav. ahhh~! It's Furuba! so cute >.<! I don't like halloween very much, but the picture looks nice. They look like they are having fun!!! Wah! This is such an awesome pic! ^_^ Your work is always so wonderful :) Thanks so much for sharing it! As always, your works are stunningly beautiful! OMG this is so cute. It reminds me of that manga/anime: fruitsbasket. :D i love that. hehe.